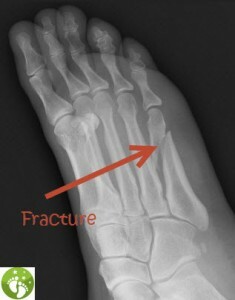 A foot fracture (or broken bone) can occur following trauma, or following repetitive activity. While many fractures occur from a fall or sports injury, seemingly harmless trauma such as bumping into furniture in the middle of the night can also result in a fracture. Stress fractures, on the other hand, occur from repetitive motion over time. Women can be prone to stress fractures, especially with advancing age. Regardless of the cause, it is important that it be properly immobilized to allow the fracture to heal. Depending on the nature of the fracture, immobilization is accomplished with a surgical shoe, walking boot, or hard cast. In some cases, surgery may be required if a fracture results in a bone or bone(s) being significantly misaligned. Contrary to popular belief, it IS possible to be able to put some pressure on your foot and/or walk in some cases after a fracture has occurred, so the commonly held belief that “it can’t be broken because I can still walk on it” is simply untrue. Walking on a broken bone is harmful, as it can result in the fracture not healing, which can lead to prolonged pain, arthritis, time off of work, and other problems. If you are concerned about a possible fracture, please call us for an appointment at 586-298-1585.